We live in a world that loves labels. We love organizing, compartmentalizing, sorting, or really, anything that gives us some semblance of structure in an unpredictable world. The musical world is not exempt from this. The issue of voice labeling is something we discussed in my studies in Salt Lake City this summer. 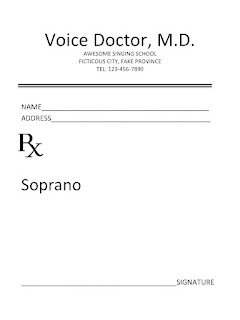 I have even heard the term "vocal diagnosis" used, as if voice typing is some kind of diagnosis by exclusion. "Since your breaks lie here, here, and here, and you're more comfortable in this part of the range, that makes you a ___________." My next question is: Does it matter? Why does it really matter if someone needs to be labelled as a soprano? mezzo? tenor? baritone? bass? a dramatic soprano? or a lyric tenor with a warm lower range? Perhaps it gives us a sense of identity. Maybe a label automatically filters out the types of roles and repertoire that are inappropriate for our vocal abilities. More likely, it is a singers response to the musical construct society has created since certain roles and voice parts need to be filled. Singers need to label themselves in order to occupy these positions. I understand that. In some cases, it's how the business works, a kind of demand-and-supply type of approach. A composer writes music for a mixed SATB choir, well, there needs to be SATB voice parts to sing that piece. However, I feel like the issue of voice labeling can create a sense of identity displacement in a vulnerable population of voice users. Of course, many careers are built from the fact that a singer's vocal abilities casts them into different character roles, such as a "Carmen" or "Turandot". But what about singers who are in the grey? Whose voices seem to straddle many different genres? Where they're in the opera chorus one day, singing medieval chant the next, and then experimenting with ingressive phonation in a contemporary piece. What should we call these vocal chameleons? I remember struggling, in the days of my preteen voice training, to combat an excessive breathiness that only maturation would help remedy. I dreamt of the prospect of finally finding out if I would be a soprano or mezzo once my voice finally matured, as if the label would signal my coming-of-age moment as a singer. Well, I'm at the stage at which my voice is no longer in its preteen state and I'm still not so sure. But I also realized that, frankly, I don't care. For me, this is a healthier mental approach to working with an instrument that is always changing. In general, I think voice training benefits from an adaptive and not a prescriptive approach. I prefer not to view it not as a vocal diagnosis but a constant process of vocal experimentation and discovery. My main concern is that I have command of an instrument that can perform a variety of repertoire. Also, that I'm monitoring my vocal health and making sure nothing pathological is developing while singing. 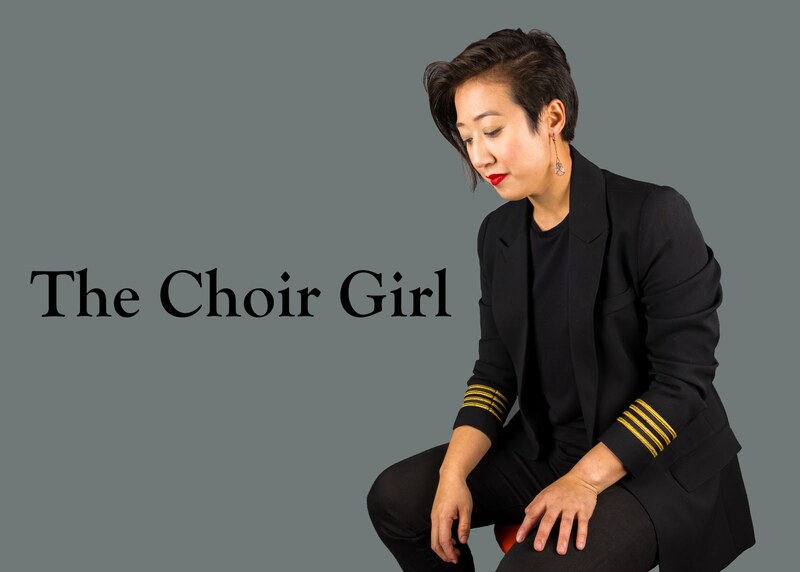 The thing about choral singing is that, regardless of your voice part, compositions demand a wide vocal range as well as diversity of vocal colors. Choristers are not type cast into iconic roles. We must be able to play a wide range of parts as per the wishes of the composer and the conductor's interpretation of that vision. No two instruments are built the same, thus, it is incorrect for them to be treated as such. This doesn't mean I won't circle a voice part when I see "S A T B" listed on a choral application. I understand I need to fit within the musical construct. If we must have a label to belong in this musical world then we must label ourselves. However, I don't feel like this proclamation needs to dictate the mental performance range of a singer. We should not be so consumed with what we call ourselves as singers, but rather, what we can do as vocal artists to effectively communicate music. After all, labels aside, isn't that what we are all here to do? Sable, I LOVE this post! You say "voice training benefits from an adaptive and not a prescriptive approach". I believe that completely from my own experience and from seeing several friends who were considered baritones "becoming" tenors. My own vocal range extends from C3 to well above C5 and my capacity to reach notes at the extreme ends of my range depends on all sorts of factors. And on top of that, male singers with a well-functioning falsetto can mimic much of the female range. Labels are handy, but shouldn't be seen as confining. An intelligent conductor will assign voices to different vocal lines according to the required artistic goal, not the voice "type". My goodness Peter, you write such articulate comments. YOU should be the one blogging :) I'm glad you relate to the labeling issue that I bring up in this post and you make a great point about a developed falsetto in the male range. I think we should always be guided by artistic goals! Thanks for reading! Thanks so much for joining my choral Love Linky party. 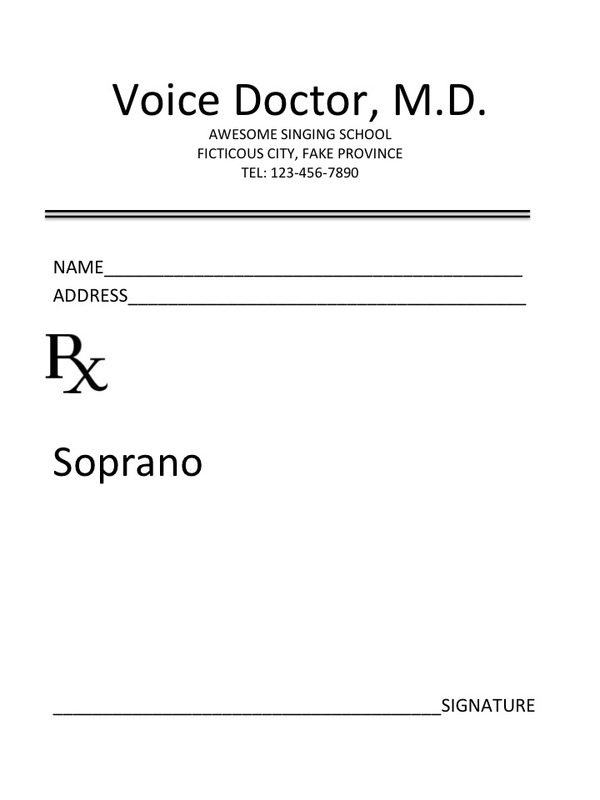 Your post addresses something that I've never even considered I assume that I am a mezzo soprano, But I have noticed depending on my degree of wellness that I can reach higher or lower notes outside of my usual range I never even thought about the fact that it could be a changing voice or my age. Very interesting! Thanks for tweeting me the link to join the Linky party! I'm glad you found the post interesting, thanks for reading! It's amazing working with a biological instrument that is always changing.